Hurricane Michael made landfall in the Florida Panhandle Wednesday afternoon as the strongest storm to hit the U.S. since 1969, and the third most powerful on record for the country. Approximately 20 million people are either under a warning or watch for hurricane, flooding or tornadoes as a result of the massive storm, according to ABC News contributor Tom Bossert, former Homeland Security Adviser to President Donald Trump. Many have also already experienced the storm's fury. As the rest of the country watches the storm inundate the Southeast, it can be difficult to navigate the slew of humanitarian organizations and charity networks out there that are promising relief and aid for those impacted by the storm. Below is a roundup of just some of the groups currently on the ground responding to areas impacted by Michael that have been approved by the nonprofit group Charity Navigator as highly-rated organizations. Just weeks after responding to the devastation of Hurricane Florence, folks at the American Red Cross are preparing to provide relief to those in the path of Michael, especially those who have been forced to evacuate their homes as the storm hits. 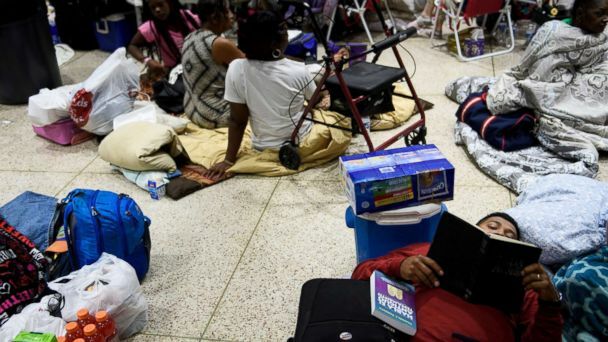 "The Red Cross is working closely with state and local authorities in Florida, Alabama and Georgia to support evacuation centers for as many as 30,000 people who may need a safe place to stay during the storm," Brad Kieserman, Vice President of Disaster Operations and Logistics for the Red Cross, said in a statement. The Red Cross is accepting donations to aid in their relief efforts through telephone, via text, and online. More information can be found here. The organization is also encouraging those who can to donate blood, writing on their website: "Severe weather events like Hurricanes Florence and Michael often force the cancellation of blood drives and decrease donor turnout in affected areas. To meet the needs in these impacted areas and throughout the country, the Red Cross asks individuals to give blood." The health-focused humanitarian organization Americares is deploying an emergency response team to Florida to respond to Hurricane Michael, they announced today. "Michael is on track to be a life-threatening hurricane," Americares Director of Emergency Response Brian Scheel said in a statement today. "Our response team is on the way and ready to meet the health needs in affected communities." They are currently accepting donations on their website. The nonprofit crowdfunding organization GlobalGiving, which supports grassroots charity projects on the ground in affected areas, has launched a Hurricane Michael relief fund. The fund will support immediate relief efforts such as food, water and medicine, but also invest in longer-term recovery projects to help residents rebuild their community after the storm recedes. The international aid and disaster relief organization Matthew 25: Ministries announced on their Instagram that they are deploying a response team to distribute aid to those impacted by Michael this weekend. "We are prepared to respond as soon as the path of the storm becomes clear we are able to reconnect with our partners on the ground to ensure they are able to receive supplies," Matthew 25's CEO Tim Mettey said in a statement. "Our thoughts and prayers are with all those who may be affected by this disaster." More information about how to get involved, volunteer or donate can be found on their website.